Two-goal hero CJ Hamilton said the squad had been massively boosted for today’s 4-1 win at Exeter City by manager David Flitcroft’s psychology during the week. The manager gathered players to speak about their motivation for success as he tried to halt a four-game run without a win. Players then made a dressing room wall collage of their families. “You get insights into different people and see exactly what is behind them rather than what you just see on the pitch. “It brought us all together and it was a really good boost for the team. He added: “The tactics that the gaffer set out today, running behind them, obviously worked. “Every time we did it we got success and I was happy to get the two goals. “Last week we weren’t the best so we needed we needed to come down here and win. “Exeter are a good team, especially at home, so to come down here and dominate them like that was good for us. 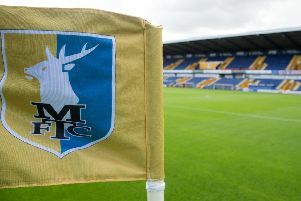 Stags are now two points outside the top three with six games to go and Hamilton said: “We only focus on ourselves so if we keep doing what we were doing today then everything should take care of itself. “After last week we needed a boost like that today and hopefully we can now play like that for the last six games.